The website has some great opportunities and resources that teachers can utilize to in classroom with their students. There is even a K-8 Introduction to Computer Science curriculum! Many may be asking why the big push for teaching coding...but there has been a lot written about how many jobs in the future are going to need these skills and we just aren't educating enough students to fill those positions. But beyond the future job market, it's a great opportunity to teach critical thinking skills, problem solving skills as well as creativity. In the video below, Mitch Resnick, director of the Lifelong Kindergarten group at MIT Media Lab, discusses the importance of young people becoming fluent in expressing themselves with new technologies, having the ability to go beyond just searching for information or navigating the Internet. He stated that not only are kids learning to code, they are coding to learn because as they code, it enables them to learn many other things. 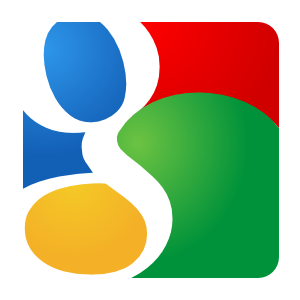 At FETC 2014, Google Senior Education Evangelist, Jaime Casap commented that we need to view technology as today's education infrastructure. Technology in and of itself is not education's silver bullet, great education is. Technology is meant to support that great education. With that in mind, it seems logical that we begin to integrate these skills into our curriculum in an effort to take learning deeper. A way to extend the learning of computer coding: have students write about their experiences. This learning provides great opportunities for writing procedural narrative...expository writing that is difficult for the younger students. The writing also provides students that time to reflect on their coding experiences, taking the learning to a deeper level. So jump on the coding bandwagon with us as we embark on this adventure. It's been 13 days since the 2014 TCEA iPad Academy and after exploring many of the resources we gathered for our Thinglink, there were a few apps I wanted to spotlight for learning, content creation, and productivity. There were many highlights for the day and the apps smackdown at the end really provided some great tips, tricks, and resources that capped off the academy. Below are some apps I think might need a deeper look. Check them out and let me know if you find some interesting ways in which to utilize them. Here are four great apps that will allow your students to create some slick looking digital content. By the way, all of these apps are FREE! Comic Maker is a great app that students love because of the comic strip theme. 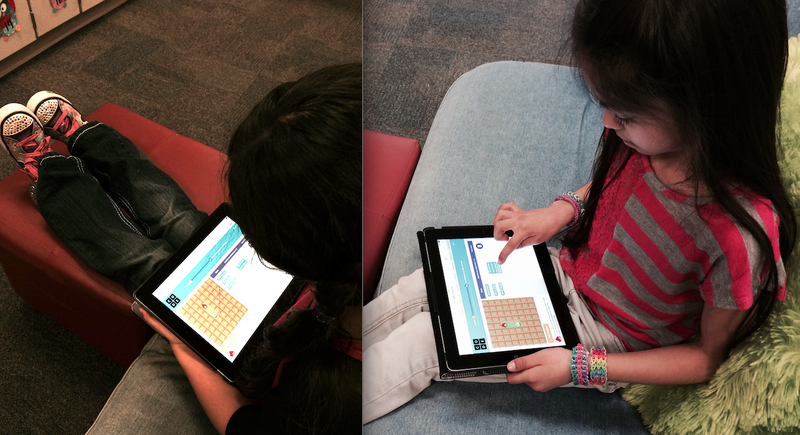 Story Me is a similar option and provides students with a little more variety. I love Face Talker! This is a quick way to check for understanding or present research on a particular subject. Slide Shark is great because you can annotate right on top of the PowerPoint slides and all your animations and videos come through on this app! Here are a couple of apps for learning. 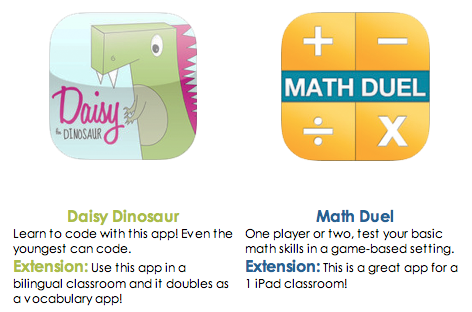 Even though Daisy the Dinosaur is for ages four+, this is a great app to introduce the concept of coding. A by-product of this app is developing vocabulary, especially for the bilingual students. Math Duel is cool because of the split screen to allow for 2 players. This is an engaging way to hone your math skills. The apps listed here are AMAZING! With CloudOn, You can actually share and edit Microsoft documents such as PowerPoint on the iPad! It has a share feature that allows you to invite collaborators. Another similar app is Documents. This is a great file manager; it replaces a document viewer, PDF reader, download manager, and music player all in one app! Sound Gecko is a great app for turning the web into audio for your listening pleasure! The last app mentioned here is Flowboard. It probably should have been listed with Content Creation apps, but you can also add links from the web to your Flowboad. I'm going out on a limb here...I think this may be my favorite app reviewed here! I think the possibilities are endless here. I wanted to mention a couple of blog posts by Richard Byrne that he's posted recently that I thought were pretty interesting. The first one was about kids becoming animators with the free app, Creative Kids. You can read more about this post here. Another great post of his was 10 Great Apps for a Teacher's New iPad. I think he's done a great job of detailing which apps to begin with! By the way, he mentioned the app Box. This app is similar to Dropbox and if you download and install now, you get upgraded from 10 to 50gb free storage. Sadly, this offer expired February 15, 2014. 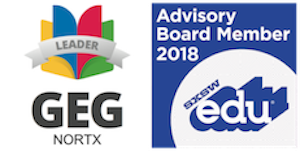 Well, another TCEA conference is in the books and this one certainly didn't disappoint, or fail to INSPIRE! 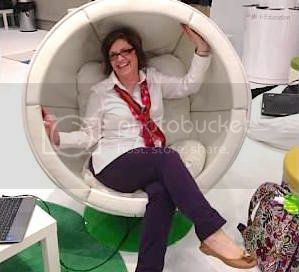 From the Google Academy on day one, through the iPad Academy, day two, and winding up on day three and four with a smattering of exceptional sessions, my cup runneth over! It's always great to reconnect with edtech friends and revisit favorite presenters to see where their learning has taken them through the year. A session on 10 iPad Projects Students Will Love provided some great resources with all the links needed to replicate these in your own classroom. Another great session included lots of tips and tricks on the iOS device with Monica Martinez. She provided this great PDF of Tips and Tricks. Another good session in the iPad Academy was Jumping In With iPads presented by Jean Friedman. I particularly liked the way she categorized various tasks and provided resources to get the job done in transformative ways. We ended the day with a TechSlam. People from the audience came up, shared their favorite apps, and demonstrated them. We really loved the app, Morfo. It's great and free; however, if you want to share the video, you have to buy the full version which is $1.99, bummer! Below is a Thinglink of all of the resources we Tweeted out during the iPad Academy. 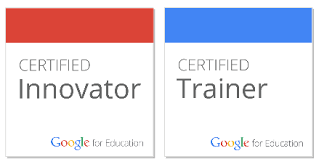 Stay tuned for Part 2 of TCEA 2014 Take Aways: Google Academy!